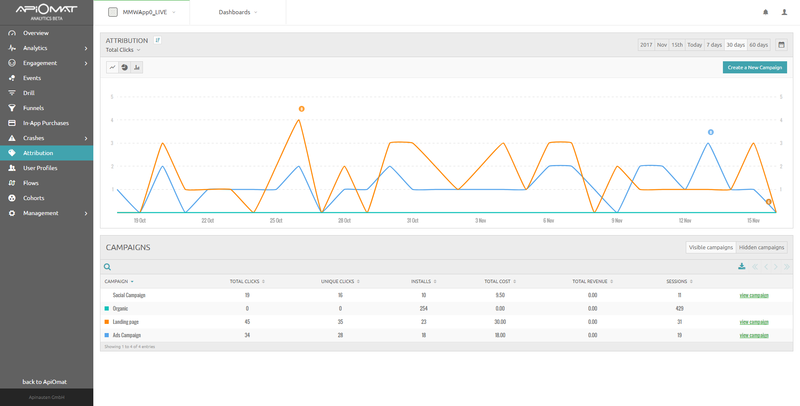 The Attribution tools track where your users come from and allows you to measure the performance of various marketing campaigns. The attribution allows you to compare organic attribution with specific paid marketing campaigns, social media or even landing pages that you've created for your application. By clicking on create a new campaign, the campaign form will appear as shown below. Clickthrough link - This is the tracking link you will be using in your marketing campaigns to point visitors to. This link is automatically generated. You can track additional segments by providing query string parameters to the url. Campaign name - Make sure your campaign name is detailed so it is easy to identify. 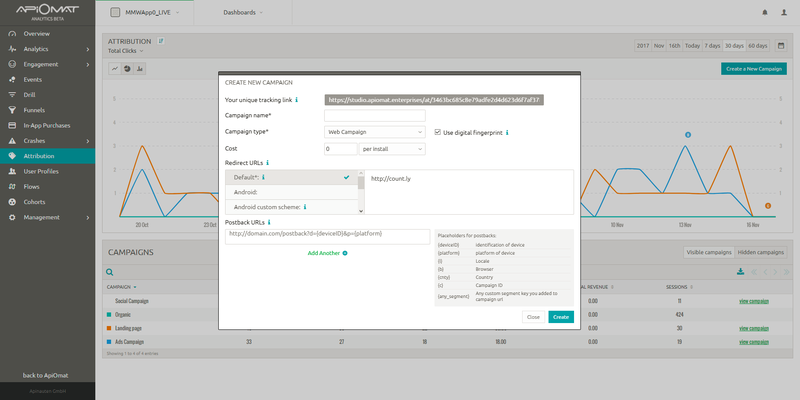 Campaign type - This can be Web campaign, Adwords campaign, Adwords app install campaign, or an universal Adwords campaign (tracking both adwords and installs). Cost - Specify the total amount spent so that the campaign ROI can be calculated. Use digital fingerprint - If digital fingerprint is not selected, attribution will be made solely based on IP address, which means allowing tracking clicks through different platforms, as for example click on Windows and then install on Android, but it also may result in more false positive attributions. Therefore we suggest that you use digital fingerprint option. Redirect URLs - Redirect URL is where the end user will be redirected to. You must at least provide a Default URL. Additionally you can provide separate URLs for each platform, but if platform can't be determined or does not have a URL, user will be redirected to Default URL. Default URL - Default URL will be used if you have not specified URL for the platform used by current visitor or the platform can't be determined. Postback URL - This URL lets you notify third party services about new installs that came from your campaign.